The outcome of the flag referendum on 30 March 2016 shows that many New Zealanders, by choosing to keep the current flag, are still happy to have the Union Jack on it. The voter turnout of 67.8 % may indicate that the third of the population who did not vote didn’t mind whether or not the Union Jack stayed or went. Ref: Auckland Weekly News, A guard of honour for the Governor at the hoisting of the flag, Devonport, May 30 1900,Sir George Grey Special Collections, Auckland Libraries, AWNS-19000608-1-2. This was not the case a century ago when the ceremony of “unfurling the flag” became a popular event at schools across New Zealand during the late 1800’s and early twentieth century. These ceremonies were designed to instil national identity and pride in children, as well as make them appreciate the honour of the Union Jack, and by association, the country’s role in the British Empire. 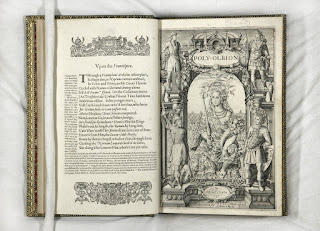 Shakespeare’s prolific contemporary Michael Drayton (1563-1631) was a poet who habitually thought on a grand scale, his taste running to epics and long, linked sequences rather than individual lyrics. He often drew his inspiration from British history and geography. He wrote at length about the battle of Agincourt, the Wars of the Roses and Edward II’s favourite Piers Gaveston. There's a bit of a movement around at the moment to #Bringbackthetrams. It's timely, given we've included trams in our latest heritage display on the second floor of the Central Library, 'Auckland's amenities', as trams were indeed the lifeblood of Auckland for decades. They ran from the mid 1880s - originally horse drawn - until 1956 when the last tram took its final ride along the city to Onehunga route. At their peak in the 1940s, it's estimated around 99 million rides were taken on trams - a phenomenal number when Auckland's population was around the 200,000 mark. 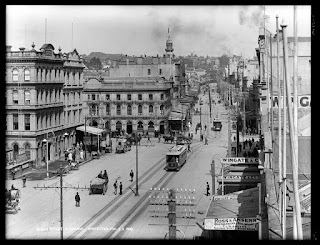 Ref: Henry Winkelmann, Looking south up Queen Street from the Gladtone Coffee Palace..., April 1903, Sir George Grey Special Collections, Auckland Libraries, 1-W1042. 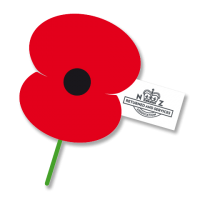 On Monday, 18 April 2016, I issued my annual Trans-Tasman Anzac Day Blog Challenge. It's where I invite people to submit their blogs, written from their research about family members who served in the wars. This year it was the centenary of the First Anzac Day. Our remembrance day that we share with our mates across the ditch. Attendances at commemorations were at a record high throughout New Zealand; and from what I have read, they were in Australia too. What is it about Anzac Day that interests so many young people and motivates them to get up to the Dawn Parade, or the Citizens Ceremony a couple of hours later? Landscapes are important. You are born into a landscape, you walk through the landscape every day of your life, as a child and as an adult. It belongs to you, and you belong to it. 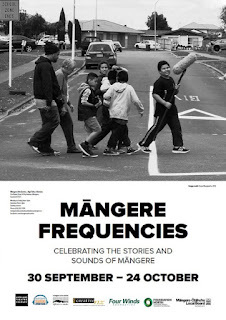 Ref: Ephemera - Arts - Māngere stories Part 1 and Māngere frequencies, 2015, South Auckland Research Centre, Auckland Libraries. 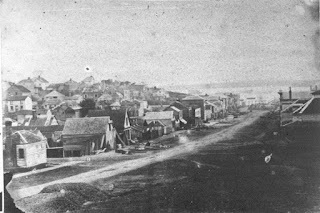 Auckland was the smelliest city in New Zealand according to a visiting reporter in 1871. Raw sewage ran into Queen Street’s main drain, the Ligar Canal, “an open, evil-smelling sewer in the very heart of the city”. Ref: James D Richardson, Looking north west along Queen Street, Auckland Central showing the Ligar Canal..., 1857, Sir George Grey Special Collections, Auckland Libraries, 4-387.